I was going to write a post about books for your horse-mad child. The stack of books has been sitting on the floor next to the couch for a week now. It will probably still be there next week. And there we have the perils of January. Good intentions go by the wayside, blog posts never get written, and I continue to attempt to sink the January blues in countless books and too much chocolate. There are worse ways to go. 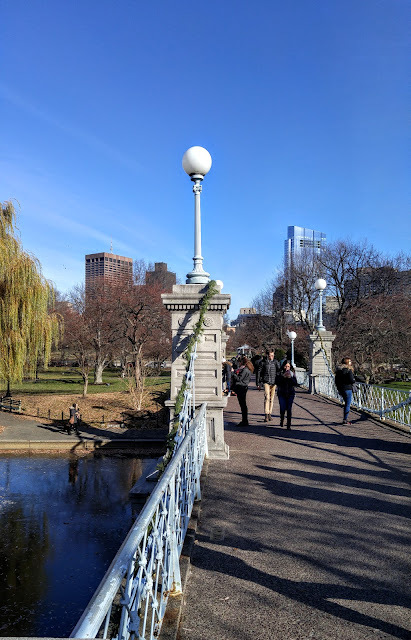 However, this is not a post in which to moan about winter but instead, one that requires concentrating on the bright spots and there have been a few scattered through the all-too-dark (literally) days. 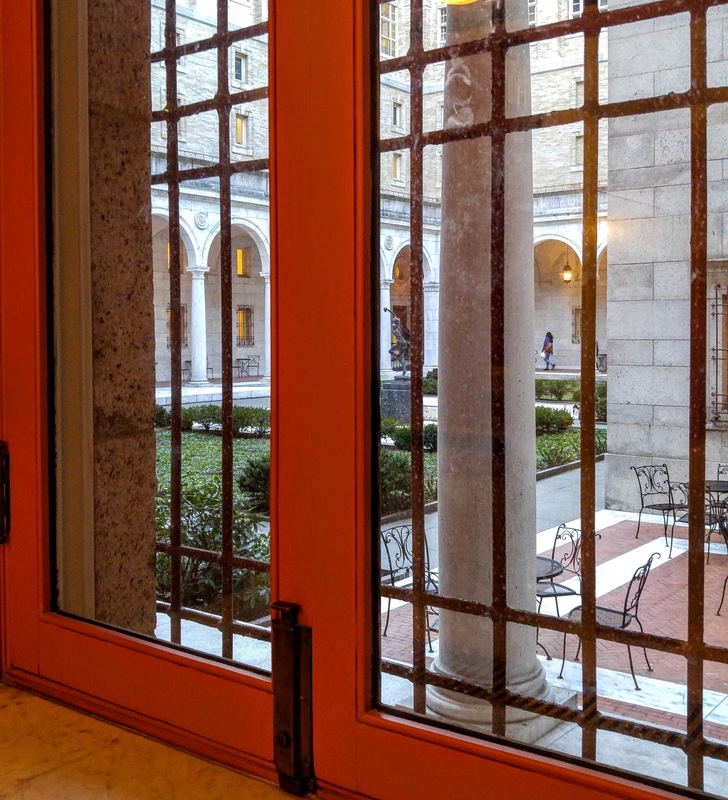 I was in Boston again recently and as usual, the Boston Public Library pulled me in. Last time I was in there it was night time and I have been meaning to go back because I wanted to see the courtyard. I like courtyards. They feel a bit secret gardenish and I have always wanted my own secret garden ever since reading the book as a child. 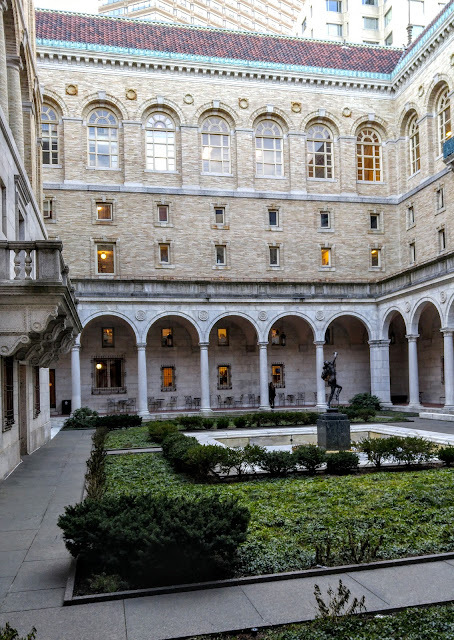 Of course, any courtyard in the middle of the library in a city is not exactly a secret but still, it gives the same feeling. Well, at least it did if you ignored the gaggle of teen-aged girls taking selfies. I resolutely looked the other way and pretended they didn't exist. It's fine, they did the same thing with me. Isn't that pretty? Imagine what it must look like in the summer. Obviously, I will have to go back and take more photos then. Hopefully, the gaggle of girls will have achieved the perfect selfie by then and moved on. I bought two books recently. You know any Golden Moments post is going to involve a book or two. Actually, I think it might be three. I am pretty sure there is another one that should show up sometime soon but I can't remember what it is and we will leave that for another pleasant surprise on a cold and wintry day. I picked up the book about the Duchess of Devonshire on a whim. She is a woman that seems to pop up in books quite a bit but I don't feel that I know much about her. This was on my favorite library book sale rack for 50 cents so hopefully I will shortly be more informed. I also got The Feast by Margaret Kennedy. I know this was because of a review I read on a book blog somewhere but, as usual, I can't remember which blog. The book showed up with a beautiful but absolutely destroyed dust jacket. Plus, the sellers had stuck a sticker smack in the middle. Sacrilege. However, I wasn't expecting a dust jacket at all and the book itself is in good condition so I'll let it go. 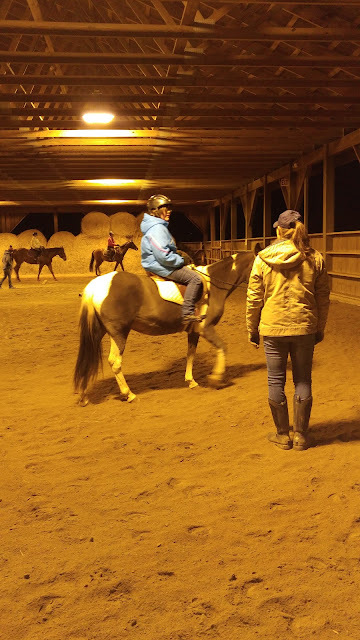 My daughter had another riding lesson and she loved it just as much as the first time. She spent the car ride in discoursing on the causes and cures for colic in horses. A close friend of mine came to the lesson. We spent the hour freezing in the dark and cold, admiring Celia at every turn, and talking like mad. A good time was had by all. My plans were rescheduled on Saturday. Yes, that qualifies as a golden moment. I was tired and just a tad grumpy. Please don't ask my kids about that measurement, I am sure they would put it higher. Anyway, plans were changed (not because of my grumpiness) and I got to stay home with the previously mentioned books and chocolate. It was glorious. What golden moment have there been in your life lately? A lot! I own a lot of books. It might be a little terrifying to actually count them. The number is probably higher than I think. I love used book sales and stores. I can spend huge swaths of time browsing. I have seen Georgiana: Duchess of Devonshire around. It looks like a book that I would really like. It is great that your daughter continues her interest in horses. Used book stores are the best. Unfortunately, there are not too many near me. However, the library in the next town over always has a sale room. I find some real treasures there. I have seen the book about the Duchess of Devonshire in a few different places. this time, for 50 cents, how could I resist? My Golden Moment this month was obviously my Japanese holiday! I'm drafting "My Favorite Books of 2016" and a separate post (or two) on Japan, but it's pretty slow going. But hey, at least I managed to start writing in the middle of my always busy workload. The Boston Public Library is beautiful, inside and out. The columns and courtyard, especially. If I'm not mistaken, that biography of Georgiana has been adapted to a film starring Keira Knightley and Ralph Fiennes. Do you enjoy watching British period dramas? I am looking forward to your posts about your favorite books and your Japan trip. I don't think I will ever make it to Japan so I will just live vicariously through you! I think you are right about the Georgiana film. I do like British period dramas but I have never seen that one. I'll have to watch it after I read the book. 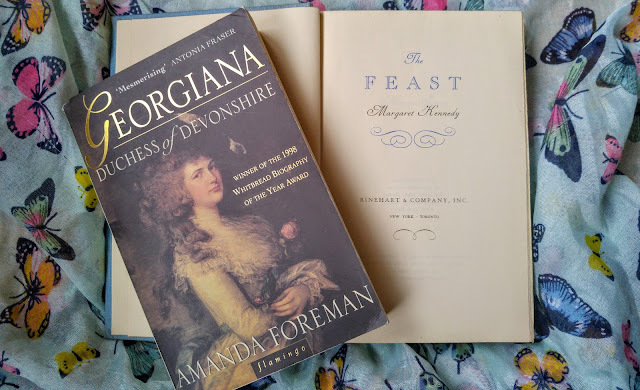 I hope you enjoy Georgiana Duchess of Devonshire - I first read the biography when I was 12 and was fascinated. Don't know if I understood everything about the weirder parts of her life. Really interesting woman - been hooked on the Regency era ever since! She does sound like a fascinating woman. The novels of Georgette Heyer are what got me interested in the Regency era. I saw on your blog that you read one recently and enjoyed it more than you expected to. I am glad. I feel protective of her novels. They are some of my comfort reads. I discovered them when I was about twelve and reveled in the romance and regency era.